The concept of the ‘everyman’ is a tricky one. In one respect it is both interesting and instructing to think that most situations, most changes in character, could happen to any of us, if only we were exposed to the correct – usually adverse – conditions. In the opposite respect there are times when we would both like with all our hearts not to feel any allegiance with a character and indeed times, comic musicals being one of them, when this drawing of parallels between Joe Bloggs and the character on stage is pretty much unnecessary. 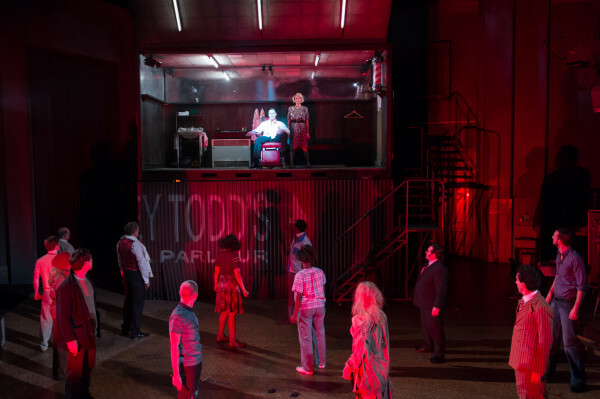 In the Welsh National Opera’s current staging of Sweeney Todd – part of their ‘Madness’ season – the character of Sweeney Todd (David Arnsperger) is just that little bit too, well, normal. Returning from 15 years in an Australian penal colony and near drowning, Todd first appears on stage looking rather dapper. This is no Abel Magwitch whose very appearance breeds fear in the hearts of those who see him. Contrarily, Todd actually looks like he could be an average town barber right down to his own freshly shaved and groomed appearance. This choice of costuming could be justified on the basis of the Demon Barber being able to lure people into his haircutting lair without them suspecting a thing, but what is less easy to tally is the delivery of the lines. Arnsperger both sings and acts the role without any overt flaws, save for the fact that he simply isn’t evil enough. Or bitter enough. Or racked with grief and injustice enough. When creeping about (although he doesn’t creep, which is part of the problem) singing the famous “There’s a hole in the world like a great black pit / And the vermin of the world inhabit it,” from ‘There’s no place like London’, our Todd sounds like he could be recommending taking the Bakerloo line because the Victoria’s a bit shoddy at the moment. He has none of the biting, spitting disgust of a man returning to the city that has been the location of everything that ever went wrong with his life. It’s fine to suggest that the average corporate city worker (for that is what he resembles) could turn mass murderer if only pushed hard enough – especially if we’re going down a Patrick Bateman route here – but it’s still necessary to somehow see this transformation, feel that this guy is actually a villain at breaking point even if just by the subtlest shiver that catching his eye evokes. Avoiding being broad is normally a good thing in theatre, but when you’re dealing with a Sondheim musical, I think it’s safe to say any attempt as realism has flown long ago, gifting a company with the opportunity to ratchet up the melodrama – something an opera company should be familiar with. Although Mr Todd didn’t quite capture the part, Mrs Lovett as sung by Janis Kelly absolutely did. In a leopard print dress and clanging gold jewellery, Kelly plays the role like the sister to Polly Peachum’s mum in Dead Dog in a Suitcase. Owner of a pie shop that could double as Kathy’s café in Eastenders, Kelly brings the correct blend of recognisable everydayness and cackling evilness to the role. She also adds the requisite amount of heightened sexuality to Mrs Lovett, absent from Helena Bonham Carter’s famous portrayal (perhaps this is harder to bring in when your husband’s directing the production). Undoubtedly the star of this staging, her demise in the oven is a regrettable moment. Aside from the lovely Mrs Lovett, the other highlight to this performance is the setting – as was also the case with the WNO’s ‘Spellbound’ spring 2015 season. Shunning the traditional choice of Victorian garb, this production is home to some stunningly vile knitwear in various daubs of mustard and taupe. The bedroom of Joanna could easily be the beautiful housebound hellhole of Jeffery Eugenides’ Lisbon sisters, complete with mocking crucifix above the bed. Her diaphanous nightie could also be a mummy Lisbon special for the Prom, although her yellow hair has something of the Laura Palmer in Twin Peaks about it. All these lemon yellows and knee high socks, just waiting for a truly demon barber to come and tear it all apart. Rosemary is a freelance arts and theatre journalist, who regularly writes for Time Out and The Stage.